General: The following routes are all located within a few minutes of each other on the south east flank of Murchison in an area referred to as The Sanitarium. These routes were discovered in November during a season when nothing seemed to be forming which leads me to believe that they come in very early and consistently. There is a small slope during the final approach that may have some moderate avalanche hazard, but the routes themselves are not threatened except during times of extreme hazard. 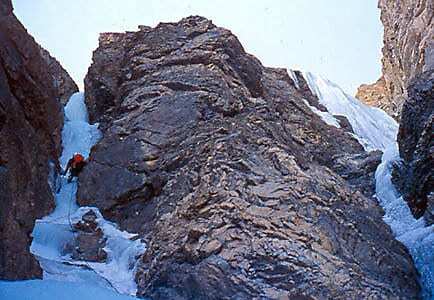 Totem and Taboo is the longest, most obvious route and was named after a book written by Sigmund Freud. Most of the route names loosely carry a psychoanalytical theme. The routes are described from left to right as you would encounter them. Totem and Taboo: Some Points of Agreement Between the Mental Lives of Savages and Neurotics, Sigmund Freud, 1913. 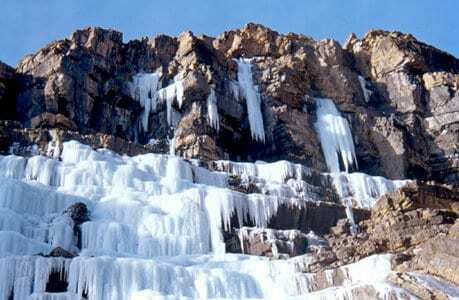 Climb: The first “pitch” consists of 40 meters of WI 2 ice. The second, 40 meter pitch of WI 3 leads to a broad, comfortable belay ledge. Another full rope length (50+ meters) of WI 3/4 leads to the top. The ice gets lots of shade; consequently, it can form quite bullet proof and brittle making it seem difficult for grade 3. Highly recommended. The following five routes are located on an ice bench to the right of Totem and Taboo. 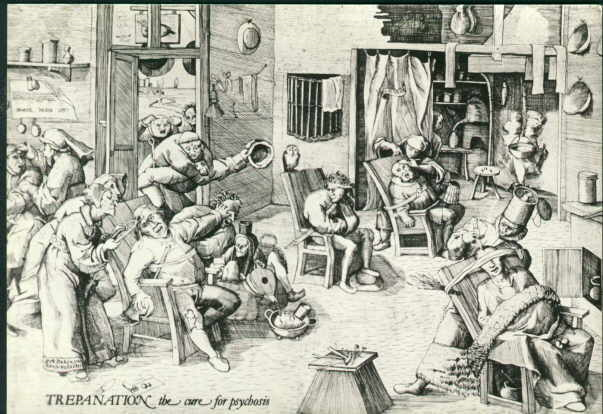 Collectively they are referred to as The Hysteria Area. Involuntary Trepanation and Morbid Fantasy are best approached by climbing two pitches of WI 3/4 directly to their bases. The other three routes are best approached on rambling WI 2 ice to their right, and walking left along the bench to their bases. Climb: 40 meters of WI 3 leads to another 50 meters of WI 4 that deposits you at the base of the final pitch of both Involuntary Trepanation and Morbid Fantasy. Climb the ramp and corner system past three bolts to the ice. (The last bolt may be hidden behind hanging ice.) 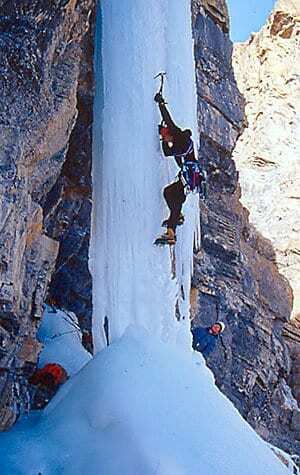 Struggle past 17 meters of hanging icicles on all sides to a comfortable ice belay. This route has everything including ice chimney climbing, wild stemming, and overhangs. 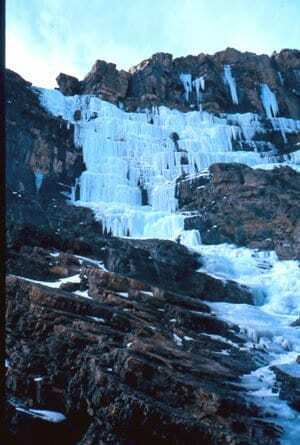 Climb: Morbid Fantasy is a pure ice line located five meters to the right of Involuntary Trepanation and around the corner 10 meters to the left of Hysteria. Although the crux is only 25 meters, do not underestimate it. The climbing is steep and technical and the ice is fragile and desperate to protect. 40 meters of WI 3 leads to another 50 meters of WI 4 that deposits you at the base of the final pitch of both Involuntary Trepanation and Morbid Fantasy. 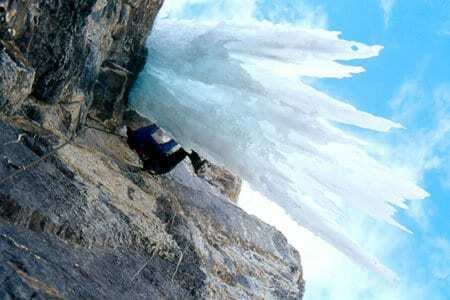 Begin the crux pitch by delicately hooking ice in the back of a thin crack in the rock. A #3 Camalot provides some peace of mind for the first delicate moves. Gain the smear of thin ice behind the hanging curtain. 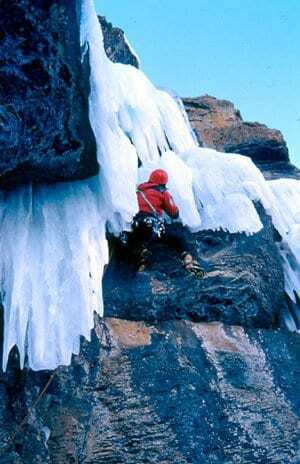 Bash an exit path through the curtain and climb gently overhanging, featureless ice for 10 meters to a good belay. If you have enough energy, you can climb another 4 meters of steep ice on the left to an equally good stance at the top of Involuntary Trepanation. Climb: Located between Morbid Fantasy and Leggo my Ego, the easiest line of approach is 50 meters of WI 2/3 ice to the right of Wizard of Id. 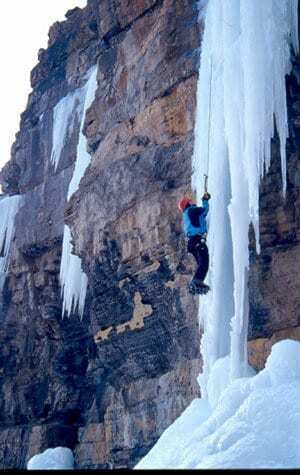 Begin at the two bolt belay and climb past three bolts to gain the thin, technical ice on the left. There is a single bolt at the top. Climb: Leggo my Ego is the free hanging dagger of ice just left of Wizard of Id. The easiest line of approach is 50 meters of WI 2 ice to the right of Wizard of Id and Leggo my Ego. There is a two bolt belay/rappel station at the base of the final crux pitch on the left. Climb the corner system behind the ice past 6 bolts and one fixed pin. Traverse right on a rock shelf to gain the dagger of ice to the top. Climb: The first pitch is at least a full rope length of rambling WI 2 or WI 3 to the base of a beautiful free standing pillar just to the right of Leggo my Ego. The pillar is short (25 meters) but steep and required a gentle touch on the FA as it was quite slender and had a fracture line at the base. In good years, it should fill out to more of a curtain than a pillar. Climb: Despite the easy grade, this line is stunning and fun. It is visible from Totem and Taboo. Continue up the approach ice past Totem and Taboo. Climb 50m of rambling WI 3 through a narrow slot in the rock to a good stance in an open bowl. Two lines present themselves. Ritalin Runnel follows the narrow, iced up chimney on the left for 50m to a comfortable belay. The line on the right is Terminal Froot Loop. Descent: Rappel the route or hike around climbers left and rappel Totem and Taboo. Approach: Same as for Totem and Taboo. The first bit of ice that you see on the approach for Totem and Taboo is the top of Terminal Froot Loop. Climb: The first 50m is the same as for Ritalin Runnel. Once you reach the open bowl, go up and right to the wide curtain of ice above you. Climb the curtain to the snow slope above. Approach: Climb Totem and Taboo or Ritalin Runnel. Hike to the top of the ice and look high up on the left. If you can’t see ice, it’s not in. Climb: A short, deceptively steep pillar leads to a sloping ledge at mid-height. Another steep, technical pillar leads to the top and may require some dry tooling to finish. Lacking sufficient ice for a belay, the first ascentionists hiked up a snow slope and put in a piton belay. The pins are fixed, but bring enough gear to back them up. Descent: Rappel the route. It is possible to hike off climbers left, but not recommended. Misc: Freudian Slip is the one route in this area that is threatened by avalanche from above and on the approach. It is not worth doing on its own merit, but might make a nice finish to a long day. There is a short, iced up chimney to the right of the route that is unclimbed. It may be an interesting objective in a good ice year or with proper rock pro.